Tadan now reads for fun, and has less headaches. Vision Therapy also helped Tadan become a better baseball player. Addison overcomes headaches, clumsiness, and problem keeping his place while reading due to Lazy Eye. 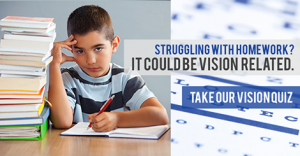 Read about Jaccob who came in with vision issues that affected his learning, self-esteem and posture. Drayton underwent patching for amblyopia (lazy eye) for 5 years, now vision therapy has helped him see the smart board and see 3D. Baylee is a 9 year old girl that has difficulty with her eyes converging and diverging, vision therapy has helped her with double vision, tracking, rereading, making up words, and skipping words.